The installation is located a few miles from the towns of Wahiawa and Mililani and is 17 miles from Honolulu. 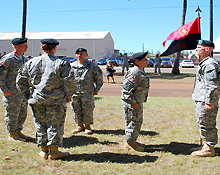 The 17,725-acre Schofield Barracks site was established in 1908 to provide a base for the Army's mobile defense of Pearl Harbor and the entire island. Fort Shafter is the headquarters of the United States Army Pacific Command, the MACOM of U.S. Army forces in Asia and the Pacific Basin.